Measure rice into a medium bowl. Place 2-3 slices of bread in food processor and pulse until fine crumbs. Add to the rice. 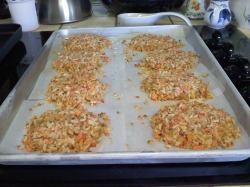 Place coarsely chopped carrots, some bottled mushrooms in garlic, about 1/2 small can of whole kernel corn, and chopped bell pepper in food processor and pulse until finely chopped. Add to rice mixture. Add the granulated garlic and egg replacer. Stir well. Form into patties (medium thickness). Brown until golden on both sides using a nonstick pan or griddle. Makes approximately 16 patties (I made mine a little too thick and got about 10). If you don't want to cook all of them at the same time, place the uncooked ones on parchment paper on a cookie sheet, cover with foil, and after they are frozen place them in baggies for later use.